At the time of the Winter Solstice of December 2012 the Sun will be moving into a part of the Milky Way “Galaxy known as the “Photon Band” along with Alcyone, which is the main star of the Pleiades. A lot of discussion of what this actually means has occurred although no one really knows for sure what will happen. One thing we do know is that we will move from the Age of Pisces into the Age of Aquarius, considered by many to be the “Golden Age”. There are 7 attunements in this system that help you to prepare for the coming changes of 2012 and beyond. They gradually increase the vibrational frequencies of your entire body. 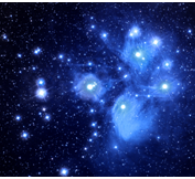 The Pleiadians, who have links with the Lemurians have come to assist us with these changes. During and after these attunements you may see that old beliefs and feelings are being released. You may also see more creativity, patience, compassion and love. A Grounding Meditation is provided to help you work with the energies.